1B Umpire Joe West ejected Pirates 1B Sean Rodriguez, Reds 1B Joey Votto and Reds CF Marlon Byrd for fighting in the bottom of the 8th and HP Umpire DJ Reyburn ejected Pirates pitcher Mark Melancon for throwing at Reds batter Tucker Barnhart and Manager Clint Hurdle for arguing Melancon's ejection in the bottom of the 9th inning of the Pirates-Reds game. In the 8th, with one out and none on, Reds batter Phillips took a 0-0 fastball from Pirates pitcher Tony Watson for a hit-by-pitch, resulting in a bench clearing brawl during which Rodriguez, Votto and Byrd were ejected for fighting, the call was irrecusable. In the 9th, with one out and one on, Barnhart took a 0-1 cutter from Melancon for a hit-by-pitch. Replays indicate the pitch was located inside and hit Barnhart in the upper torso; warnings had not previously been issued, the call was irrecusable. At the time of all ejections, the Pirates were leading, 3-0. The Pirates ultimately won the contest, 3-0. These are Joe West (22)'s fourth, fifth, and sixth ejections of 2015. These are DJ Reyburn (70)'s second and third ejections of 2015. DJ Reyburn now has 8 points in the UEFL Standings (4 Previous + 2*[2 MLB + 0 Irrecusable] = 8). Joe West now has 3 points in the UEFL Standings (-3 Previous + 3*[2 MLB + 0 Irrecusable Call] = 3). Crew Chief Joe West now has 15 points in Crew Division (11 Previous + 4 Irrecusable Call = 15). These are the 146th, 147th, 148th, 149th, and 150th ejections of the 2015 MLB Regular Season. These are the 68th, 69th, 70th, and 71st player ejections of 2015. This is the 67th Manager ejection of 2015. This is the Pirates' 5/6/7th ejection of 2015, 1st in the NL Central (CIN, PIT 7; CHC, MIL, STL 5). This is the Reds' 6/7th ejection of 2015, 1st in the NL Central (CIN, PIT 7; CHC, MIL, STL 5). This is Sean Rodriguez's first ejection since May 25, 2014 (Larry Vanover; QOC = U [Fighting]). 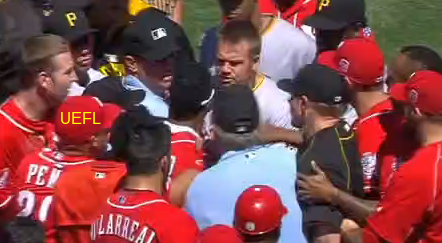 This is Joey Votto's 2nd ejection of 2015, 1st since May 6 (Chris Conroy; QOC = U [USC-NEC]). This is Marlon Byrd's first ejection since July 8, 2010 (Hunter Wendelstedt; QOC = Y [Check Swing]). This is Mark Melancon's first career ejection. This is Clint Hurdle's 4th ejection of 2015, 1st since July 11 (Vic Carapazza; QOC = N [HBP/Foul]). This is Joe West's first ejection since June 2 (Mike Matheny; QOC = N [Balls/Strikes]). This is DJ Reyburn's first ejection since May 6 (Joe Maddon; QOC = Y [Balls/Strikes]).